Long before the 2008 election, it simply won’t matter whether or how most Americans vote. Whether they stay home, vote for Ronald McDonald, pick a name out of a hat, or spend countless months deliberating over the right choice for America’s future, their decision will be essentially meaningless with respect to the ultimate outcome of the election. While this is a bit of an exaggeration, in terms of perception, the reality is that this is how most Americans will feel (and will be told by the media) as a result of a flaw in the design of the Electoral process, which assigns the entirety of each state’s electoral college votes to the winner, regardless of their margin of victory (true for every state but Maine and Nebraska). In the 2004 presidential election, 31 states (including the District of Columbia) had voter margins exceeding 10%, setting up a scenario where the results of those states’ elections, and the subsequent assignment of their allocated electoral college votes, was known with near certainty long before the actual election. Another 10 states had margins exceeding 5%, leaving only 10 states where the results were close enough to leave a sense of uncertainty. The media made this point clear. And worse, the candidates and their campaigns made this equally clear by focusing their campaigns on these few states and essentially eliminating all communications in the other 40 states. The effect of this condition is predictable and disheartening. Voter turnout varies significantly based upon whether you live in a state where your vote “matters” or not. 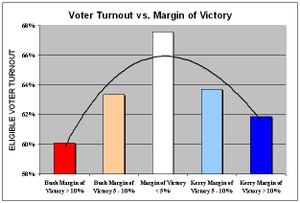 As shown in the chart on the right (click the chart to enlarge), average voter turnout in states with greater than 10% election margins was nearly 7% lower than turnout in states where the results were less certain. While this is certainly influenced by the increased media attention and “get out the vote” campaigns in those hotly contested states, the undeniable fact is that voters in the vast majority of the states feel somewhat left out of the democratic process, and they often show it by becoming disinterested and removing themselves entirely. Designed originally as a means to help keep the smaller states from being rendered powerless by the more populous states, the Electoral College is no stranger to debate. As recently as the 2000 election, a chorus of people called for an end to the Electoral College, arguing that it was an antiquated process that was no longer relevant in modern times. However, the difference between their argument and mine is one of goals. In 2000, the voices of change were advocating it largely out of political convenience, namely because their candidate (Al Gore) had lost the election despite winning the popular vote by more than 500,000 votes. My position and proposal are not motivated by a desire to help shift circumstances in the favor of my candidate (as evidenced by the chart below which shows that the results of the 2004 election would have remained the same under my proposed change – again, click chart to enlarge), but rather, a sincere concern and a desire to avoid a political outcome that I foresee in the future – where presidential elections are decided in a few swing counties in Florida and Ohio, while the rest of the country becomes a passive spectator, watching as $500mm of television ads are run in Dade and Cuyahoga counties. I am not proposing that we eliminate the Electoral College. However, I believe that by simply changing it so that Electoral College votes are allocated pro rata according to the actual election results in that state, two important changes will happen. First, from the perspective of individual voters, the perception of voting importance will be universally and immediately increased. And second, from the perspective of politicians, every vote will count the same – a vote in Ohio will no longer be more important than a vote in Utah, and as a result, candidates will have to speak to the entire country as opposed to carefully dissected swing subpopulations. In the chart below, I have attempted to demonstrate how this proposal would impact the results of the 2004 election. For the purposes of this chart, I chose to use two decimal places. However, in a real election setting, I think you would have to eliminate rounding entirely. This obviously would mean the end of the human role in the Electoral College, as you cannot have 5.53467 individuals from Arizona casting votes for President Bush, but I think it's a small and necessary change, which would dramatically improve presidential politics. Many of the initial people that I've spoken to about this proposed change have reacted in similar ways. Their first response is usually something along the lines of "hum, that makes sense", but they quickly follow it up with some variant of "yeah, but I'm sure they had some good reason for designing it the way it is, so it's probably better just to leave it as is." In actuality, there seems to be at least reasonable data to support the idea that the actual process of the election of the president was given relatively little thought (as compared to other more controversial matters at the time) beyond ensuring that George Washington would be elected the first President. The reality is that, regardless of the legitamacy of the original idea, the world has changed enough in the past 200+ years to merit at least an honest assesment of whether or not we're still employing the best system for the conditions of our time. The advent of radio, then television and now the Internet have dramatically changed the communication landscape from the original print world within which this system was devised, and given how dramatically each of these has impacted our own lives, it seems fair to assume that they would have some impact on presidential politics as well. While I think there is data to support my belief that a simple change like the one that I am proposing would positively impact voter turnout (which would be a good thing), that's not the underlying reason for this proposed change. The real reason is that as politics gets increasingly sophisticated with the continued development of instantaneously integrated nationwide real-time tracking polls, many Americans will be increasingly left out of the system - ignored because their vote is meaningless in a state that was decided years before the actual election - and our country's top official will be elected based upon how well his or her views sell in Florida or Ohio, rather than in every living room in America. While this might be in the best interests of people in Dade or Cuyahoga county, it sure doesn't seem like it's in the best interest of our country. I think the best way to increase voter turnout is to adopt the Oregon plan where everyone mails their ballot in. The result of this rather simple fix was tremendous. In 2000, 79% of registered voters cast ballots, and in 2004, this number reached 86%. The best answers are many times the most simply ones. Your proposal makes complete sense. Regarding the idea that the Electoral College made sense then, therefore it makes sense now does not hold water. Sadly I think are inability to update a system that needs it is due to the lack of true leadership within each party. I mean leadership driven by character, and not personality. Collmer, feels like you accurately capture one of the challenges with the Electoral College. However, while the logic of your thought process is sound, I think the goal of increased voter turnout is a dubious one (especially given your politics). As you note, the 2004 "get out the vote" campaign backfired on the Dems as the Right used the organized religion soapbox/pulpit to mobilize a huge body of would-be no-shows to the ballet boxes. In this way, your proposal would further exacerbate the challenge that has perennially plagued the Dems: lack of sufficient organization. Additionally, your proposal could stand to move us toward a more Populist state and we could again find ourselves with a Reagan-esque leader (see Collmer post “Remembering Reagan”). If I were to look at reforming the Electoral College, I would probably go the opposite way, toward a caucus set-up (I believe some states already do this but I’m ignorant of which ones). From my perspective, the fewer uneducated voters, the better (specifically: uneducated about the issues and the candidates; not uneducated in the broader sense). Think about states where Judges are appointed vs. elected. I tend to think that appointment (at least at the state level) makes a ton of sense as typical voters do not spend enough time studying the merits of each candidate. Can we extrapolate this to the National level…? Foreign Policy – Are the Dems going to knee-jerk from Interventionist and campaign on Isolationism? Doesn’t feel great. Education – While the Dems have a lock on the Teachers’ Union, is that an asset or a liability? Healthcare – Again, should we spend more or do the Dems have the conviction and fortitude to make the necessary reforms? Environment – At least Global Warming is heating up (no pun intended). Could this one issue be enough for an entire campaign…? 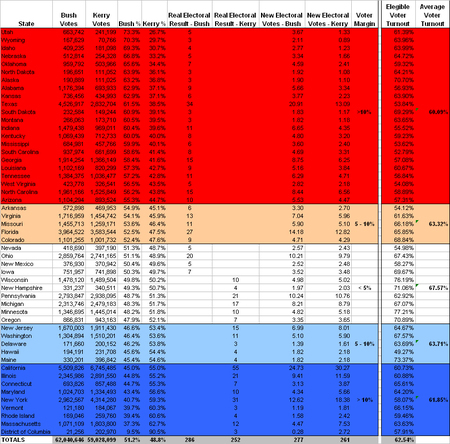 Regardless, I struggle to find any note-worthy macro issues for which the Dems stand. Mr. Collmer, I have faith that you will help lead your party to a more focused stance and capitalize on this opportunity that the Republicans have provided. Now is the time to organize, come together, and focus on issues that matter. It is very refreshing to see such well thought out issues discussed in a productive manner. I applaud the attempt. I don't have much to add on the Electoral College, but obviously a system put in-place in a much different time to manage a muc smaller process, could use a little upgrade. Maybe they should be upgarrding (I assume it is in the works) how votes are cast, and when it is a no brainer for all to vote then they might get a little more focused on why their particular vote is altered by an additional layer that I am sure 99.9% of voters do not understand. The current voting system kind of makes me think of the Dewey Decimal System from the junior high library...We can file taxes electronically, obviously we should vote electronically, and how those votes trickle through the system, I guess has to still be debated. this issue is bigger than the Dems position on immigration or trade. i fear those with political power won't fight for real change until we've established a fair and inclusive process to elect them. one step down this path towards democracy -- which is inherently progressive in the long-run -- is counting each vote equally, so that we can say, without being maddeningly disingenuous, that every vote matters. there is an easier, though perhaps less "politically viable" solution that i'm sure you're aware of but i will state anyway: move to a pure popular vote -- whoever has the most votes wins. of course, this is exactly what your proposal accomplishes, but why add the conversion of votes into electoral numbers? one person, one vote makes sense to EVERY American -- I'm sure millions already think it's what we have -- and if we had a government and media that worked for the people, it is what we'd have.